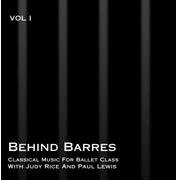 The Behind Barres CD series is recorded at Solid Sound, Inc. in Ann Arbor, Michigan by Rob Martens. We use only one microphone (a Stephen Paul modified-AKG C-24 stereo tube) with their Yamaha C-7 piano, and no EQ or signal processing. Their idea is to create CDs that sound just like having Paul Lewis in the dance studio with you. All of the magic is provided by Paul Lewis with Judy Rice! 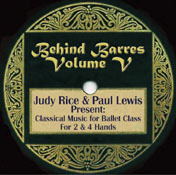 > Click and Hear The Music From Volume I Instantly Classical music for ballet class, both barre and centre, arranged and performed to capture the movement of dance on CD! Featuring composotions by Glazunov, Poulenc, Tchaikovsky, Delibes, Lehar, Carpentar, Pugni, Faure, Minkus, Messeger, Bach, Gottschalk, and Khachaturian. 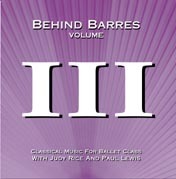 > Click and Hear The Music From Volume III Instantly The third in the Behind Barres Classical Music for Ballet Class CD series, featuring compositions by Delibes, Morrow, Lamb, Gounod, Minkus, Drigo, Nazareth, Joplin, Tchaikovsky, Rimsky-Korsakov, Faure, Carpenter, Albeniz, Strauss, Glazounov, Khachaturian, and Meyerbeer. Both at barre and centre. 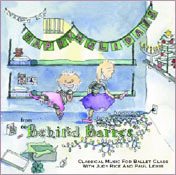 > Click and Hear The Music From Volume IV Instantly The Fourth Volume in the Behind Barres Series, featuring traditional Christmas and Chanukha music arranged and performed on piano for ballet dance. Includes selections from Tsiachovsky's Nutcracker, Silent Night, Greensleeves, First Noel, Maor Tzur, the Dreidl Song, and more! > Click and Hear The Music From Volume V Instantly We decided to make this volume just a little bit different. 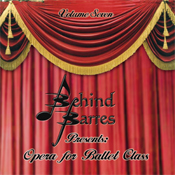 Most of the tracks on this album are salon and turn of the century piano pieces arranged specially for ballet class. 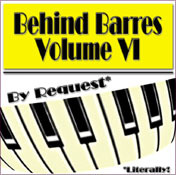 As a special treat, nine of the tracks are four-hand piano pieces. As always, we hope you will enjoy it. > Click and Hear The Music From Volume VI Instantly Over the years we have had many requests for the music contained on this CD. To satisfy all our wonderful friends and colleagues we have decided to put them all out at once, plus some. Therefore, we are proud to bring you "Behind Barres Volume VI", quite literally...By Request! > Click and Hear The Music From Volume VII Instantly Some of the finest melodies ever written are found in operas and operettas. 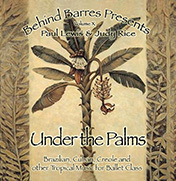 Behind Barres presents a sampling of that glorious music specially arranged for ballet class. We hope that you find some of your favorites here along with others that may be new to you. > Click and Hear The Music From Volume VIII Instantly Remember when televisions actually had to "warm up"? Well, on this disc we invite you to take a trip with us to experience some of the finest tunes ever written for TV, specially arranged for ballet class. 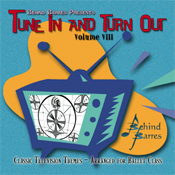 We hope you and your class will warm up to these classic TV themes as you, "TUNE IN & TURN OUT". > Click and Hear The Music From Volume IX Instantly More television themes, including one from a popular animated series about a sponge who lives at the bottom of the ocean. 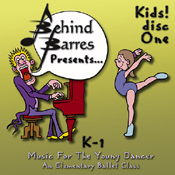 > Click and Hear The Music From Kids Volume 1 Instantly Behind Barres is now bringing their expertise to the young dancer. This new CD includes the beauty of the classics as well as the spirit of such childhood favorites as "Bingo", "Spongebob Square Pants", and "Once Upon a December" for the teacher to choose from all in one album. The class includes an elementary barre, music for improvisation, basic center work, a variety of music for turns, sautès, skips, polka steps, pas de chat, and reverence. If you are looking for inspiring music for the young dancers' grand allegro, music that is the right tempo for teaching beginning chaine turns, or some fun petite allegro, Kids One is the CD you have been waiting for. > Click and Hear The Music From Modern Dance Instantly Tracks 1-4 & 14-17 are ideal for use as stretch or warming / cooling exercises. Tracks 5-13 are tailored with particular rhythmic patterns and exercises in mind. For ease of use in the studio, we've listed for each track, the meter, tempo, and number of measures for preparation.